These wonderful people came to speak at Google a while back, and I'm pretty sure I mentioned them already...or I meant to, anyway. 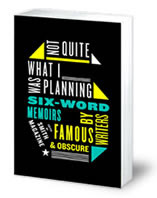 The book is a compilation of six-word memoirs, from "writers famous & obscure," and really is an interesting phenomenon. Read this article from the National Post, written by Rachel Fershleiser (one of the book's editors, and an all-around awesome chick) for more information on the book and how it came about. Or just visit SMITH Magazine's website about it. Or both. You should also read this review from the New Yorker, written entirely in six-word sentences...which, admittedly, I did not realize was on purpose until reading Rachel's NP article. Don't I feel foolish. Oh, and buy the book. It's around $12 at a bookstore near you, or get it used for around $6 on Amazon.